Hunting Bruce, Or, On The Trail Of The 'Jaws' Shark Thirty-five years after Jaws, NPR's Cory Turner sets out to confront his childhood fear of the fictional great white by coming face to face with the beast that terrified America — if he can find it. The original Jaws (1975) starred not one but three mechanical sharks, collectively nicknamed Bruce — after director Steven Spielberg's lawyer. Here, one of the Bruces takes a break on location in Martha's Vineyard. This shark rested on a platform when not in use, to protect it from the saltwater. Joe Alves, art director of Jaws, poses with the endoskeleton of one of the original Bruces. Alves's life-size drawing of the shark can be seen on the wall behind. In a photo taken during filming, actor Ted Grossman is about to meet his end in the Amity Island estuary. 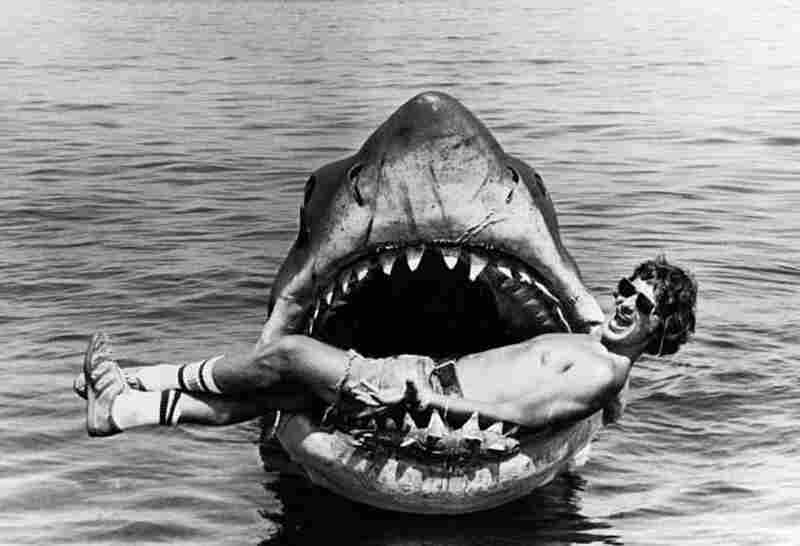 Steven Spielberg, director of Jaws. One of the original Bruces, staying dry above just some of the equipment needed to bring it to life. Two of the three Bruces had their sides exposed for easier, faster maintenance of the shark. Bruce is controlled by a crew - and a considerable amount of hardware - visible on the skiff to the right. 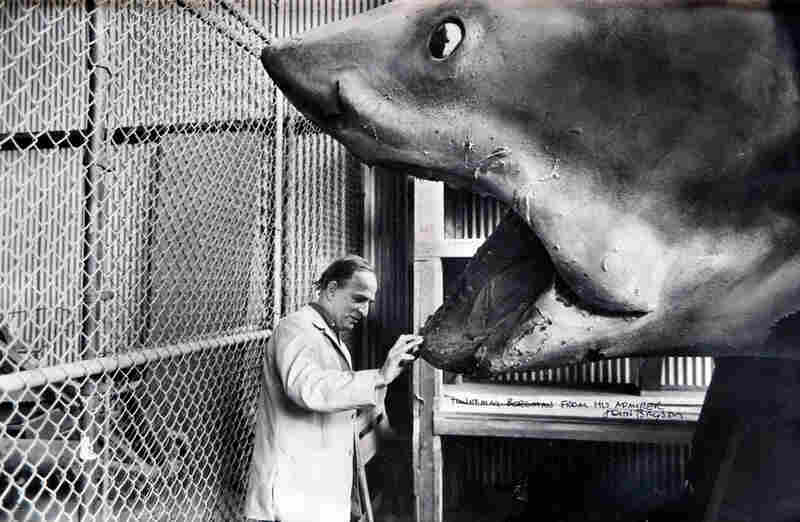 Ingmar Bergman, the late director, examines one of the three original Bruces. This is the last known published photo of any of the original Bruces; it was taken in 1975, several months after the film's release. 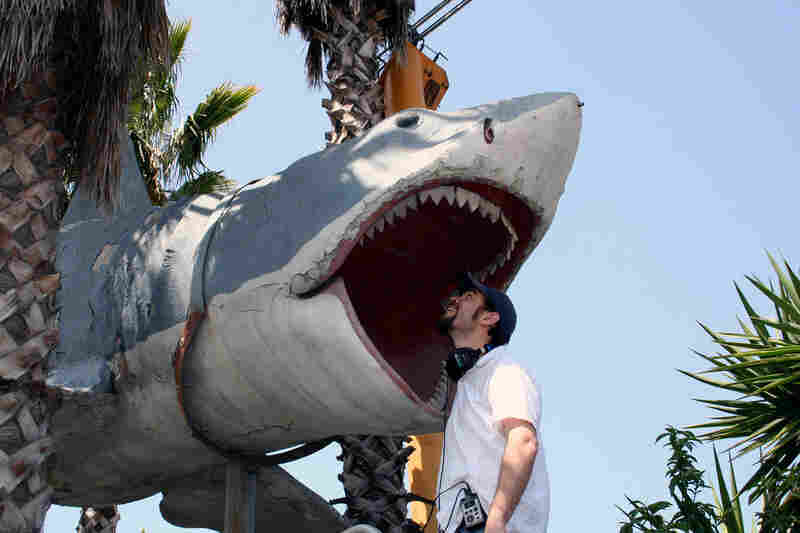 NPR reporter Cory Turner meets the fourth Bruce ... and finally gets to "touch the shark." This Bruce was not used in the movie but appears to have been cast from the now-lost Bruce mold. 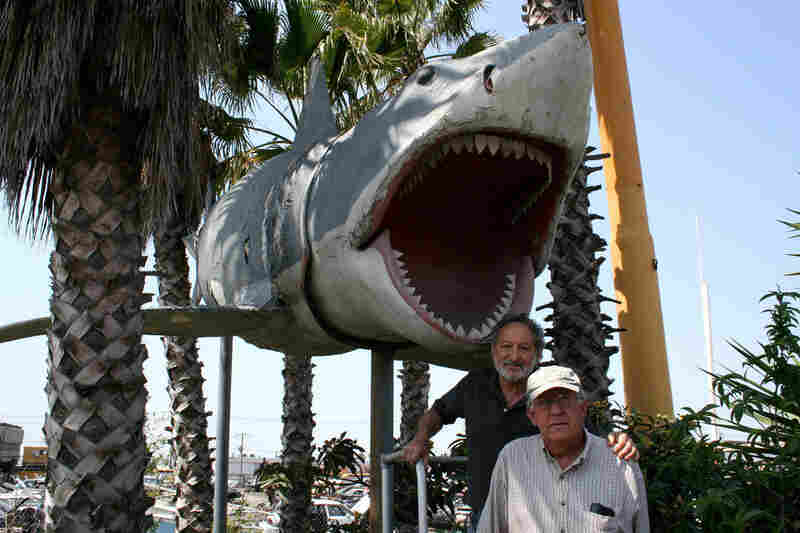 It hung on display at Universal Studios from 1975 until 1990 and now sits high above the U-Pick Parts yard owned and operated by Aadlen Bros. Auto Wrecking in Sun Valley, Calif.
Art Director Alves (left) and Roy Arbogast, who helped build the original Bruces, with the fourth Bruce in Sun Valley. Thirty-five years ago this month, one word was on the minds -- and lips -- of American moviegoers: "Shark!" On June 20, 1975, Steven Spielberg's Jaws opened in theaters across the country. It starred Roy Scheider, Richard Dreyfuss, Robert Shaw and a newcomer to the screen: Bruce the mechanical shark. The film was both a commercial and critical success, claiming record box-office grosses (until it was eclipsed two years later by Star Wars) and earning several Oscars as well as a Best Picture nomination. Bruce itself became a cultural icon -- more than the sum of its elastomer skin and pneumatic parts -- and gave the beach jitters to generations of Americans. Including me, once I finally saw it -- Jaws terrified me so much as a kid that one important fact didn't immediately occur to me: The shark was fake. Then I found a photo of Bruce being built, a workman leaning harmlessly into its mouth. That was my Heart of Darkness moment. At 10 years old, I decided that (a) I had to see Bruce for myself and (b) I had to touch it. Why? Simple: How dangerous is a shark you can touch? There was just one problem: I couldn't persuade my parents to take part in a pilgrimage to one of the two places I thought Bruce might be: Los Angeles, where it was built, or Martha's Vineyard, where the film was shot. So I had to wait -- until this spring. But I'm getting ahead of myself. Let's start with the name. It came from director Steven Spielberg -- or rather from Spielberg's lawyer, Bruce Ramer. 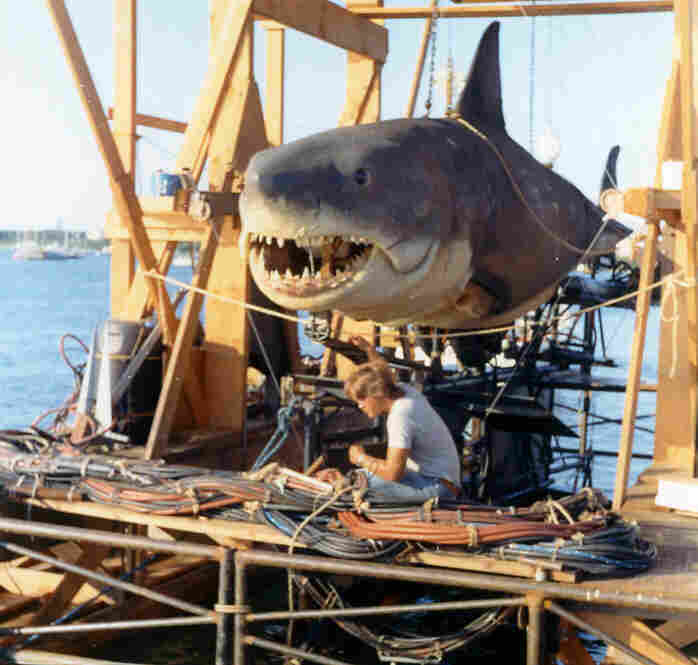 The shark itself was every bit as big in real life as it's described as being in the film. So when marine biologist Matt Hooper (Richard Dreyfuss) exclaims, upon first seeing the shark, that it's a 20-footer, and Robert Shaw's Quint the shark hunter corrects him, saying it's 25, Quint's right. The film's art director, Joe Alves, was hired to create the shark, and he remembers very clearly how he decided on those 25 feet. He made two life-size paper drawings of Bruce -- one 20 feet long, the other 30 feet. He took the two to a parking garage on the Universal Studios back lot and put them side by side for studio executives. In a classic Goldilocks moment, the bigger shark seemed too big and the little shark too little. So Alves took the middle road. Thirty years later, Jeff Pirtle, NBC Universal's manager of archives and collections, invited me to his office on the Universal Studios lot and showed me a number of Alves' original schematics for the shark. 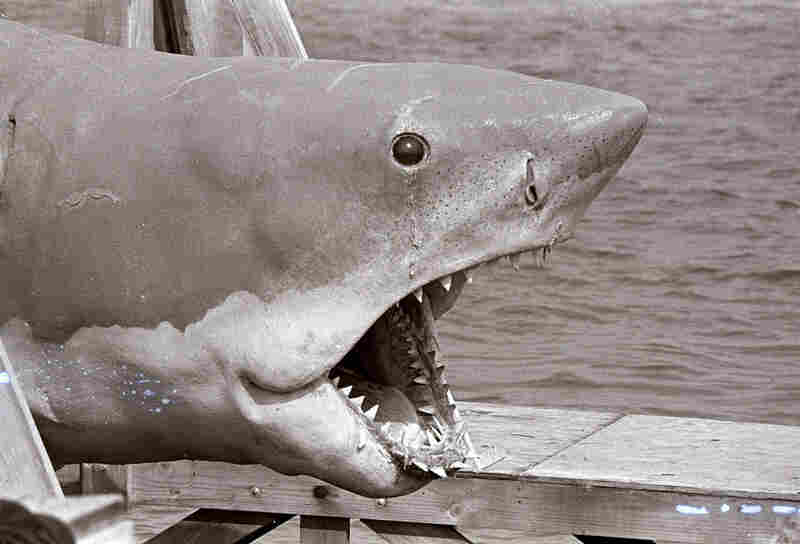 The width of those famous jaws: nearly 5 feet. The head alone, according to one schematic, weighed 400 pounds. And the most important number of all: three. 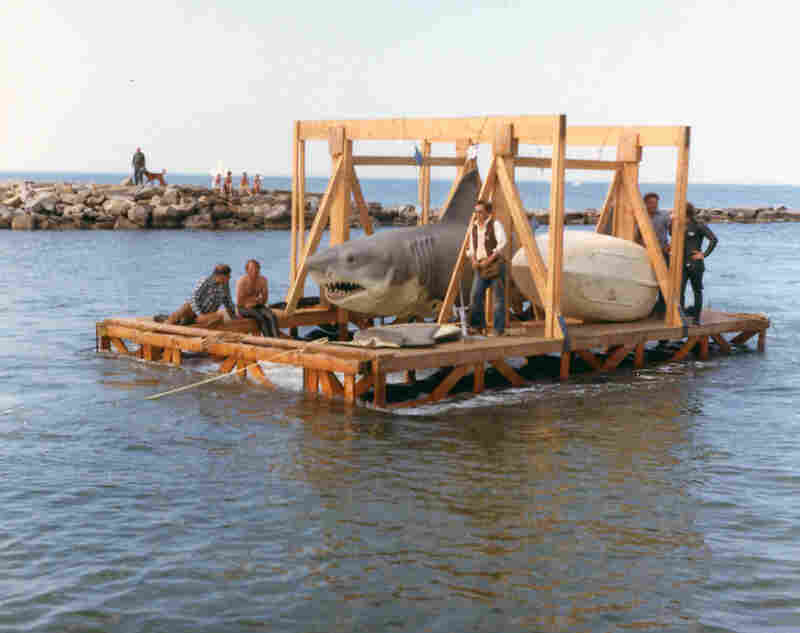 There were three Bruces, not one, created for the original Jaws. All three sharks were created from the same mold. One was pulled by boat, when it had to swim convincingly on camera. The other two sat atop a metal arm, hidden underwater so they could, among other things, vault onto the deck of the Orca and make short work of Robert Shaw. And while you wouldn't know it from watching the film, Bruce the mechanical shark had a dirty little secret: It didn't work very well. Stories abound of the animatronic shark stalling the moment it hit water and sinking to the seafloor. In fact, the finicky mechanics ended up pushing the film both over budget and over schedule. But Alves insists that when it worked, the shark "was just great." "When it first comes out of the water, and [Roy] Scheider says, 'C'mon down and chum some of this [stuff],' and you look and the shark comes up, it was just fantastic," he recalls. So what happened to Bruce? I took my question straight to the top, to Spielberg himself. Actually, I got his spokesman, Marvin Levy, who's been working with Spielberg since Close Encounters of the Third Kind. "The original Bruce -- or Bruces -- were all destroyed," Levy told me. "So there is no Bruce existing anywhere, nor any parts thereof." I held out hope. Maybe there's something hiding in a warehouse or archive somewhere? But Marvin was quick to set me straight: The Bruces, all of them, are gone. But Who Would Dismantle Bruce? And Why? 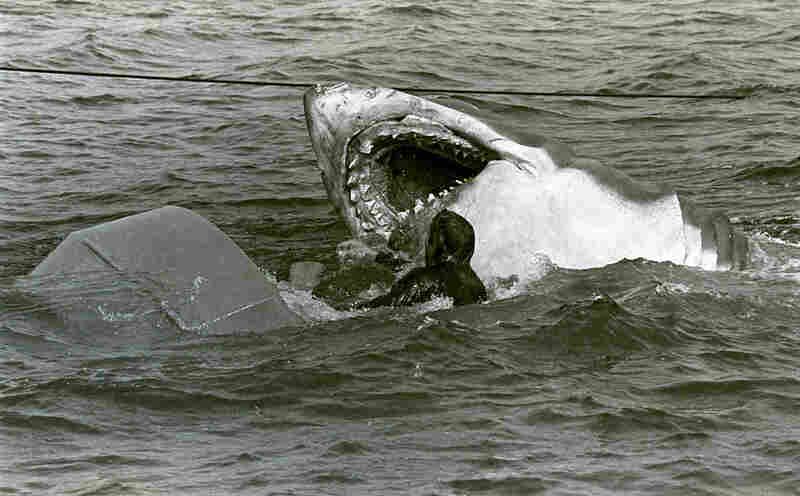 Alves says that by the time they finally finished shooting Jaws, saving Bruce simply wasn't a priority. "We were in deep trouble," he says. "The studio was reluctant to make the movie; they had no confidence in it. When we came back, they just dumped the sharks in the back lot, and they just rotted away." Heartbroken, I visited Facebook, where Bruce has its own page -- and more friends than I ever will. Many of those friends hold out hope that it's still alive -- I mean, intact. And it's here -- on Facebook -- that I first heard about a possible fourth Bruce. It sounded too good to be true, so I asked Pirtle, the NBC archivist. And he laughed. 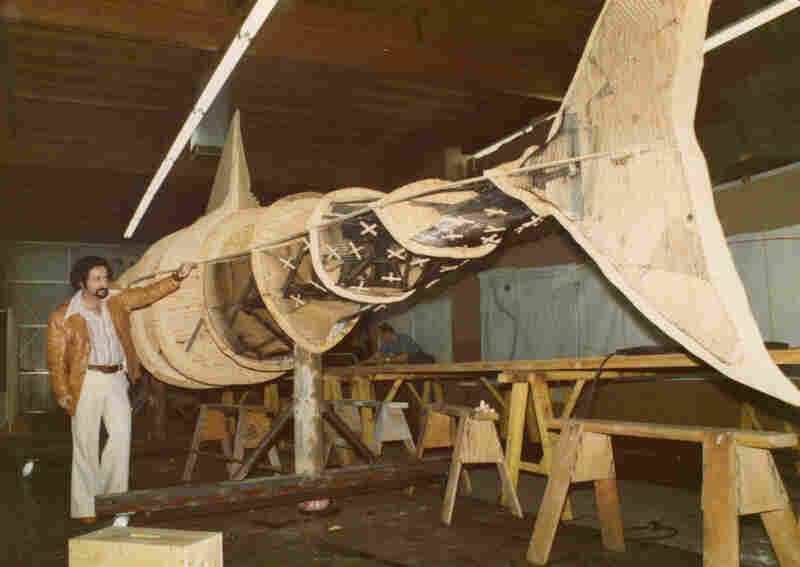 "The fourth shark was brought to my attention probably two years ago, by a Jaws fan who had found my phone number and said that the fourth Jaws shark was in existence at an auto parts junkyard in Sun Valley," Pirtle said. 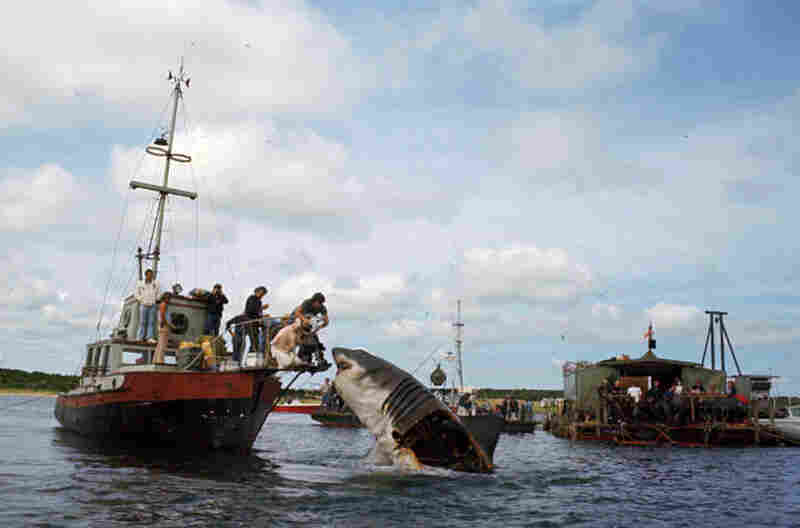 According to Pirtle, this fourth shark was never used in the film, but it does appear to have been cast from the original Bruce mold at the time of the film. It was made for use at the Universal Studios Theme Park in Hollywood, where it hung by its tail from 1975 to 1990. "Hi, I'm calling from NPR. Do you happen to have a shark in your junkyard?" Then, a few calls into my list, the voice on the other end of the line didn't hang up on me. It was the voice of Nathan Adlen of Adlen Brothers Auto Wrecking in Sun Valley, Calif..
Adlen inherited the business from his father, Sam Adlen, who in 1990 was buying vehicles from Universal's transportation department. Adlen doesn't know exactly how it happened -- his father died more than 10 years ago. All he knows is one day, lumped into a batch of cars from Universal, there was a shark. "It caught my father's eye," Adlen said. "When it got here, it was a little bit damaged. I think we added the teeth back to it and whatever else needed mending." I flew across the country and headed for Sun Valley. But I had to be sure this was Bruce, so I brought a little help: the man who designed him, Joe Alves. And Alves brought his friend Roy Arbogast, whom he hired more than 35 years ago to help create the original Bruce mold. We met at Adlen's U Pick Parts auto yard. Adlen led us through a compound of buildings, through a garage and a pair of gates until we emerged into a sea of junked cars -- 26 acres' worth -- and a tiny oasis of palms and loquat plants. In the middle of that oasis, atop two metal poles, was a shark. Its skin was cracked; its color badly faded. Instead of rows of menacing teeth, it had harmless wooden dentures. But as Alves pointed out, the size was right. "You know what amazes me though, seeing it?" he said. "How big the damn thing is." But was it Bruce? Alves thought so, but he deferred to Arbogast. Arbogast walked under the belly of the beast, poking it with the handle of a rake. Then he stopped. I watched him, anxiously awaiting a verdict. "That's the real one," Arbogast said. I asked if he was sure. "Definitely. It's from the same mold," he said. "It's just kinda nice to see it again after 25 or 30 years. It's amazing that it's still here." It's older than I am, this fourth Bruce. And while I know I'm not 10 years old anymore, I just couldn't help myself. I asked Adlen if he has a ladder. A few minutes later, two men emerged from the garage with a wheeled platform ladder, like you'd expect to find on an airport tarmac. They pushed it right up to Bruce's lower lip, and I climbed. Its jaws are open, and I leaned in close enough that I could see individual flecks of paint peeling from the creases of its mouth. I looked into its eye, then back to its splintered fence row of teeth.